pasta | Frozen Pizza, Again? These noodles have all the toppings except for sesame seeds. This dish has become a favorite in our house. 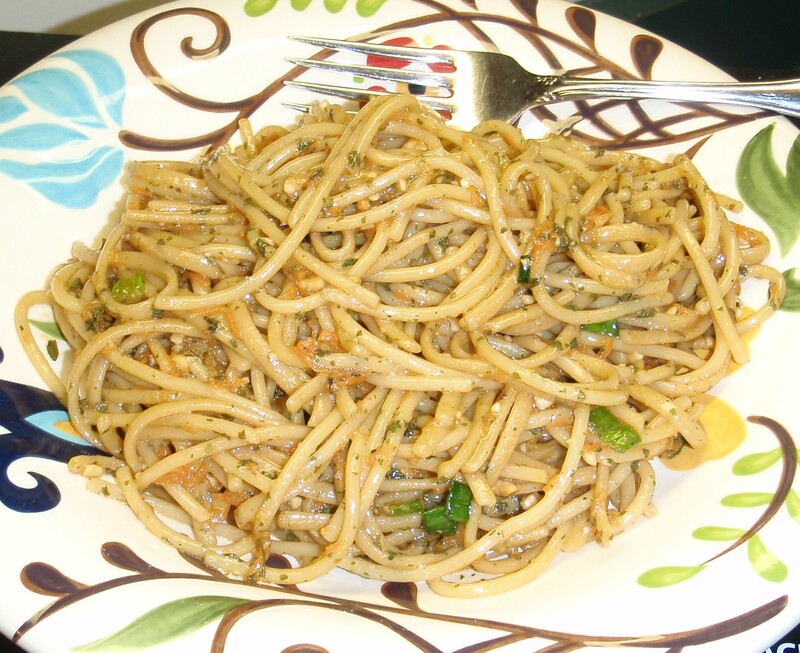 It’s quick and easy to make (which I like) and super yummy (which both Russell and I like). This is a great go-to meal for those days you really don’t feel like cooking but you still need to feed your family; and you probably already have a lot of these ingredients in your kitchen. These noodles only have carrots and green onions. Cook noodles according to package directions. Drain and return to pot. While pasta is cooking prepare toppings: peel and shred carrots (you can use a regular cheese grater to shred the carrots); chop green onions, fresh cilantro, and peanuts. Heat oil and crushed red pepper in a small saucepan over medium heat for 2 minutes. Pour heated oil through a mesh strainer/colander into a large glass or ceramic bowl (plastic might melt and metal will get too hot). Reserve oil and discard red pepper. For mild heat use ½ Tbsp crushed red pepper, for medium – 1 Tbsp, for hot – 1 ½ Tbsp, and for very spicy – 2 Tbsp. 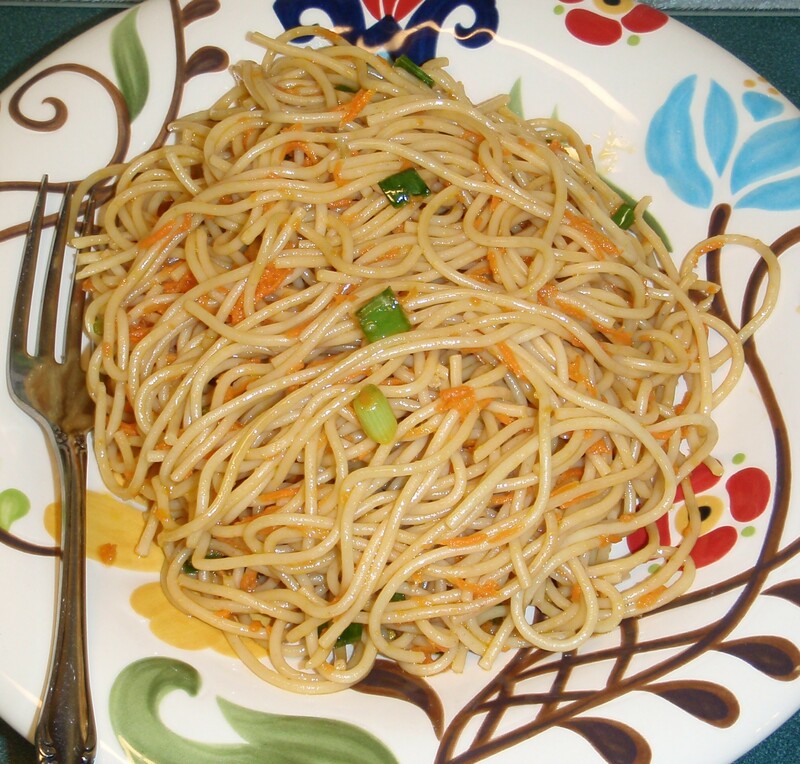 Leave the red pepper out all together if you would prefer non-spicy noodles. Make sure to set a timer while the oil is heating. The longer you leave the red pepper in the oil the stronger the heat will be. Also, the oil will start to burn if you leave it on the heat too long (not that I know that from personal experience or anything). 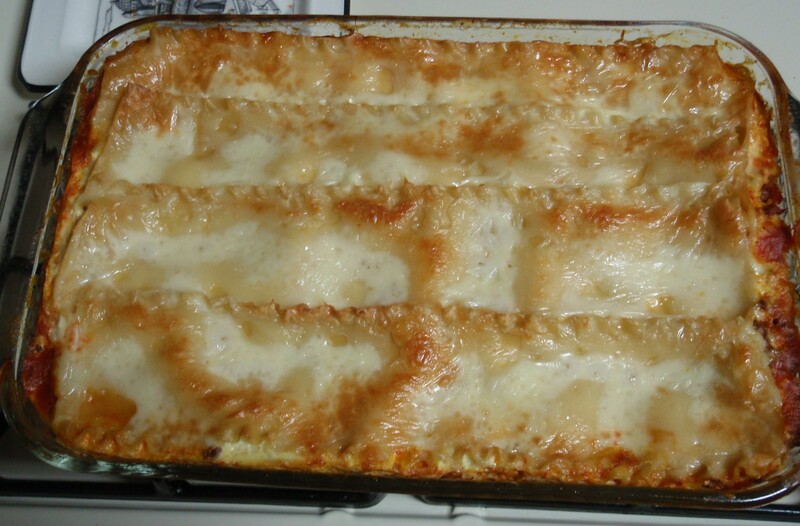 This was my first time to make lasagna from scratch; usually I just buy Stouffer’s frozen lasagna. And now that I think about it, the only lasagna we ever ate in my family growing up was Stouffer’s frozen lasagna; I’m fairly certain my mom doesn’t even have a recipe for lasagna in her recipe book. So I was pretty excited to make my first lasagna because homemade lasagna just screams “whoever made this is a domestic goddess” (well, it does to me). And I am earnestly trying to increase my domestic goddess skills. I was expecting this to be a hard task because homemade lasagna makers seem to complain about how involved it is to make a lasagna. But I didn’t think this recipe was any more involved than other casseroles I’ve made. Sure, you have to take time to prepare and then layer the ingredients, but I can think of at least 2 other dishes that involve a similar process. 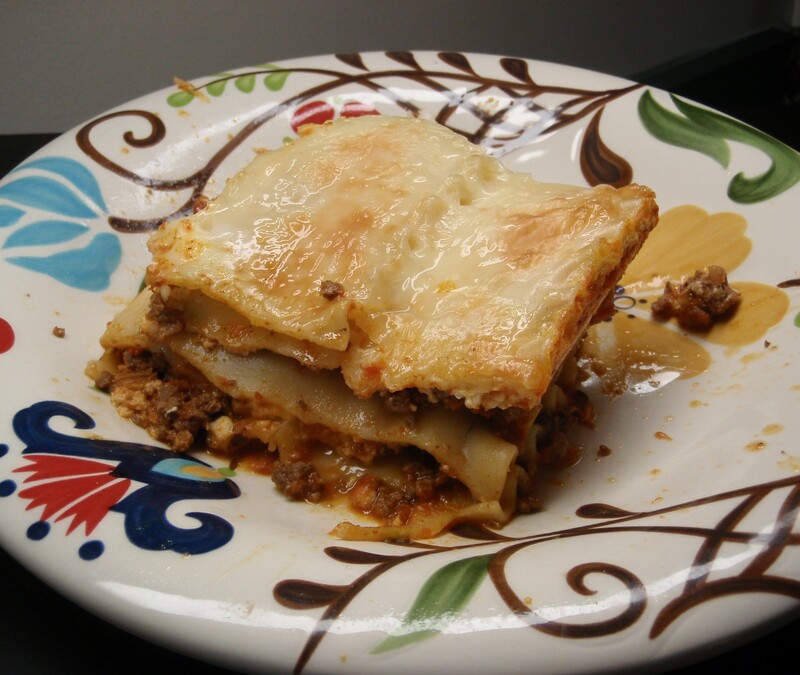 So, if there are any other novice cooks out there wanting to attempt a homemade lasagna, this is a great recipe with which to start. Preheat oven to 350°F. Spray a 9×13 casserole dish with non-stick cooking spray. Set aside. Brown meat in a large skillet. Drain grease, and then rinse meat to remove any extra grease. (I did not rinse my meat and the flavor was not affected. However, I do think that the extra grease might have prevented the sauce from clinging to the noodles.) Season the meat with salt and pepper, to taste. Add spaghetti sauce to browned meat and mix well. Bake for 45 minutes. Let set about 10-15 minutes before serving. 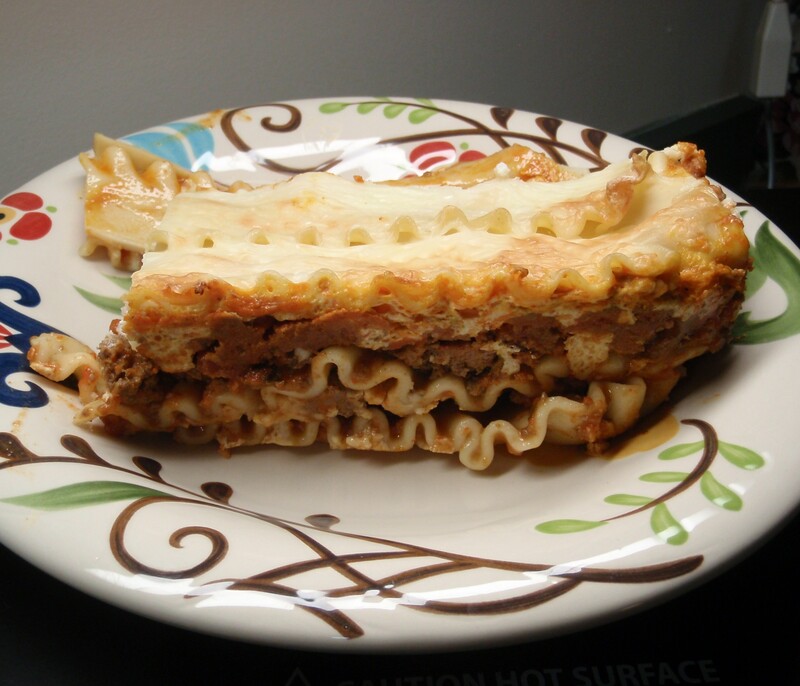 The lasagna will completely fill your casserole dish once it is assembled. Unless you are using a deep dish I recommend putting a cookie sheet under the casserole dish to catch any spillovers during baking. You should definitely serve this with plenty of grated parmesan. My family has a saying, “Cheese is good. Cheese is your friend.” My family eats parmesan cheese on just about every pasta dish. I just recently learned that Russell’s family only eats parmesan cheese on spaghetti. I find that very sad. 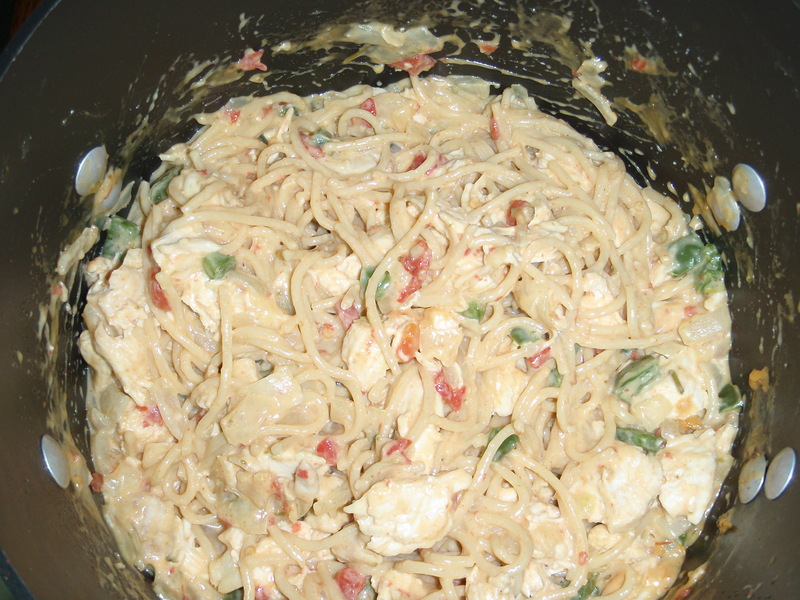 Tonight for dinner I made creamy garlic pasta to go with sautéed shrimp. The shrimp, though delicious, is not the point of this post; that pasta is. I must have not read all of the ingredients when I pinned the recipe to my food board because it wasn’t until I started making this for dinner tonight that I realized how delicious it was going to be. 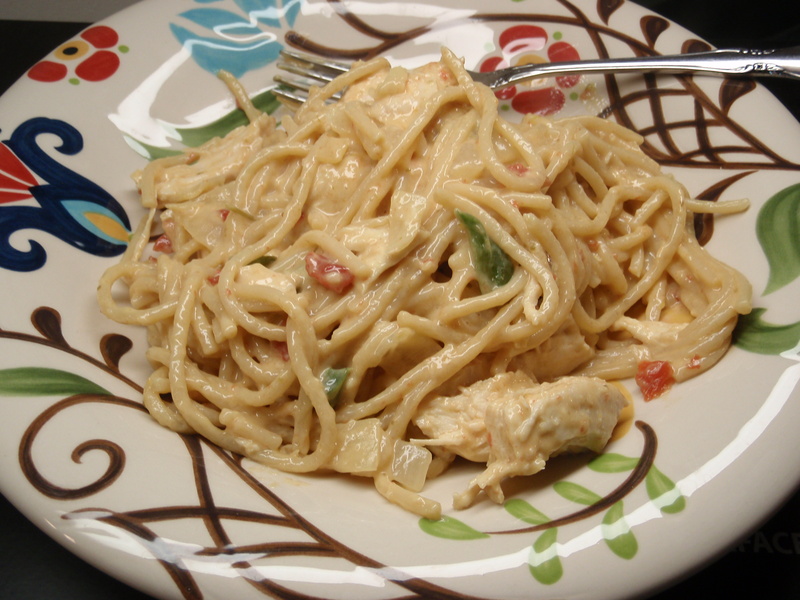 The name alone contains three of my favorite of ingredients: creamy sauce, garlic, and pasta. I used to buy Pasta Roni (well, store brand version) all the time, but after realizing how much sodium is in one of those little boxes I stopped buying them. I’m also trying to cut out processed foods from our diet, and that sadly includes Pasta Roni. (I’m not going to the extreme of cutting out all processed food but more along the lines of prepackaged, convenience foods such as boxed rice/pasta and canned veggies.) But, now that I’ve discovered this awesome recipe I can have Pasta Roni without the prepackaged part. Yay! The only sad part is that my pasta was gummy instead of creamy. I’m not completely sure why this happened, but I think it’s because I let the liquid cook down too much after the pasta was done before adding in the next ingredients. Next time I will measure out all of the ingredients before beginning to cook. The recipe is from “the cheese pusher.” (awesome blog name!) I hope you enjoy it as much as I did! If you try it let me know; just leave a comment below. Oh, and I used 2 cups chicken broth, 1 cup water because I didn’t have 3 cups of broth. Like I said before the flavor was still great.